I can speak from experience that I have been living out this concept for the past two years. Please go the the "Hissem" post in the BTTF posts. There you will see my home made "NON DESTRUCTIVE" time machine conversion. I can honestly say that it can be done without any hole drilling in the body. There are no scratches on the body panels or the front bumper. All hardware parts that go on the pontoons are mounted to a plate of aluminum that has same shape and contour of the pontoons. That way there are no holes that were drilled there either. The wires there go around the front fenders and up to the back are all clipped with stainless steel clips with a rubber backing that don't scratch the panels. I have been dreaming and planning on making a time machine for the past 15-20 years and doing it without damaging the car. I have been saving parts and making parts that I hoped to go onto a DeLorean if and when I got a DeLorean. I have years of practice in fabricating all sorts of large and small projects, so this came easy and natural to me. The hard part was making fitting and adjusting the parts delicately around my car. I could take it all off if I wanted, but so far I have no desire to. That option will still be an option 10-20ish or more years from now. I rest in that thought of that. I do drive my car daily except on salty and snowy roads in the winter. Driving a time machine on a daily basis can test your patience and attitude. I enjoy it 99% of the time. I drive it for my own pleasure, so I don't let the opinions of criticism get to me. I have not heard any direct criticism from random places, so it has been encouraging. Some people I come across can not contemplate spending the time and money in doing that. I have been dreaming of this for my whole life, and I can't describe the satisfaction of accomplishing this dream. When those who criticize that, I wonder if they have accomplished their life long dreams? I believe in preserving the integrity of the cars history and story more than making it movie accurate. I am have fun with the best of both worlds. That catch is that without taking out the back window or using accurate parts, I can not claim a replica status. I claim a very close representation in what it should be. I have done the best with the resources that I have access to. I drive it in the rain, and there is no harm to any of it. It can be a little annoying when I clean around the flux bands. I want to thank Mark D for his help and advise in helping me accomplish my life long dream. Thanks buddy!!! Are you in my RentDelorean.com database? I am always looking for new time machines to add to my referral list around the country. "Where we're going, we don't need... roads." Last edited by Hissem; 01-08-2017 at 04:06 PM. 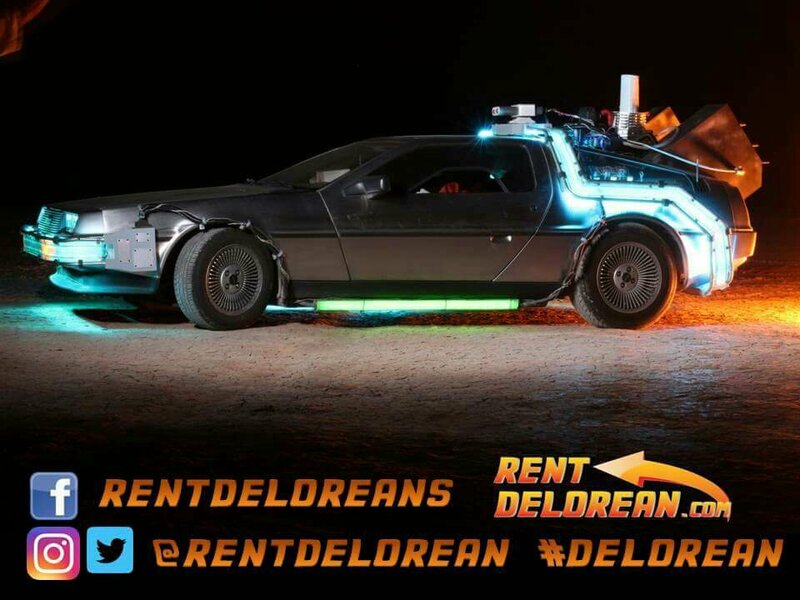 The way I've set up RentDelorean.com is basically, if a potential client emails me looking for a delorean in their area, i simply send their information your way. You then let them know your terms, costs, and such. I NEVER recommend my Delorean guys ever let someone else drive their cars. In the end, if you made money off the gig I referred to you, I simply ask for a small referral fee. IF you didnt make anything, or the gig never came to fruition, I don't ask for anything. I base things on the honor system. It has been pretty successful. I am always looking for new guys around the country so if/when an inquiry comes in, I have Delorean owners all over that agree to my terms. I hope that makes sense. What are your thoughts? Count me in Andy. I cant believe that people aren't lining up in the streets for a non-invasive conversion that can be un-done within 1 hour!!! I want to take a quick survey. If you, as a Stock Delorean Owner could convert your car into a NON-INVASIVE BTTF Car with things like: Exhaust fins, light up flux bands, and general outside Time Machine looking parts, that are attached without drilling holes into your car... Would you buy such parts? I'm currently working on a project that will offer stock D owners some outside parts that can be attached to your car fairly easily without costing a fortune, and can be used for the BTTF owner for entertaining the public and detached when wanted. Is this something the community might be interested in? My theory is, many of us owners are BTTF fans, but don't have the $$$ to send it to the professionals to get a permanent conversion. If you could purchase a few BTTF Exterior parts to attach to your car to impress the public, would you? I've attached some photos of my non-invasive conversion. Everything you see here is attached to the car yet can be taken off with no harm to the car itself. I would be interested in what you had available. More so in the interior department but I am interested specifically in the Front Flux bands and the Glove box radiological meters. Is your timecircuits static? I have mine as a 7 inch iPad in a box magnetically mounted on the dash. Doesn't work well in daylight though. You can always hit me up on FB. Here's the kit I made for the back... It's not drive-able as the vents are made from gator board (high density foam core). I used it for a couple of events for static display and just set it on top of the engine cover. I've since got some more accurate parts I will be installing - like the correct hubcap, and heat sinks for the reactor, and the oil separators. However I think even in this state it's really close in spirit. Next up is accurate flux bands, boxes, and wormhole emitter. I've already got the speaker grille for the wormhole emitter. I myself wouldnt mind a non-destructive mod I could put on occaisonally, depending on the cost of it. It is something to consider. What parts are you thinking of? I remember my Mom and her friends baking cookies every Christmas. One woman would just bake prune cookies....while another would do just macaroons... They would get together before Christmas and swap cookies.......so that they would all have a variety of cookie trays for Christmas. We need to get this same concept going for BTTF enthusiasts that don't have 50 grand to spend on a conversion. If we split up the work, and "mass produce " parts, it will make things easier for everyone. For example, the engine covers would be easy for me to make... I could even laser-cut them. Same for vents (If I had dimensions). Andy does gatorboard vents too. For the moment, I am looking to do exterior only....non-destructive.